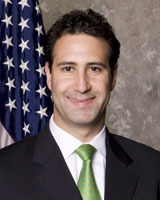 As a senior executive, Drabkin has also served as the deputy program manager of the Pentagon renovation program; the assistant deputy under secretary of defense in the Office of the Deputy Under Secretary of Defense (Acquisition Reform); and the director, regulatory reform and implementation, where he served as the project manager for FASA (WHAT IS FASA?) implementation. Michael Robertson was appointed as the White House Liaison for the U.S. General Services Administration effective March 4, 2009. Before coming to GSA, he served as the deputy working group lead for the Energy and Environment Agency Review Team on the Obama-Biden Transition Project. Immediately prior to that, he was the Director of Congressional Affairs on the Obama for America Presidential Campaign, where he was the primary point person for securing endorsements and super delegate support from House and Senate members. Before joining the presidential campaign in early 2007, Robertson served as then-Senator Barack Obama’s legislative coordinator and Deputy to the chief counsel. In this position, he managed the appropriations process, handled judicial nominations, and conducted political outreach to promote Obama’s legislative priorities. In 2004, he worked in Chicago on Obama’s successful Senate campaign. Before entering the political field, Robertson worked in venture capital in San Francisco. A native of Fresno, California, Robertson graduated with a bachelor of arts from the University of California at Berkeley, earned his juris doctor from Golden Gate University School of Law, and is working toward his second law degree, this time from the Georgetown University Law Center’s Masters of Law program. Robertson faces some challenges, particularly with GSA’s Office of Governtmentwide Policy, which has been languishing for awhile — and it should be one of the most vital parts of GSA — and there are some real opportunities. « DorobekInsider: What’s behind the cyber-czar Hathaway resignation? And why is this post so difficult to fill?